At a price within reach. Built from the ground up with a native touchscreen interface – but retaining all of the tried and true capabilities of the G3X – the new G3X Touch is the smartest, most advanced large-format flight display we’ve ever designed (and priced) specifically for experimental/amateur-built aircraft. Up to 3 large, high-resolution 10.6” displays that are configurable in split-screen mode, the G3X Touch offers incredible installation flexibility. Add the optional GTR 20 remote comm to tune frequencies with only a few touches and gain powerful features like 3D Audio that are typically only found in audio panels. Consider the GTX 23 ES remote transponder to free up even more valuable panel space for your displays, as well. 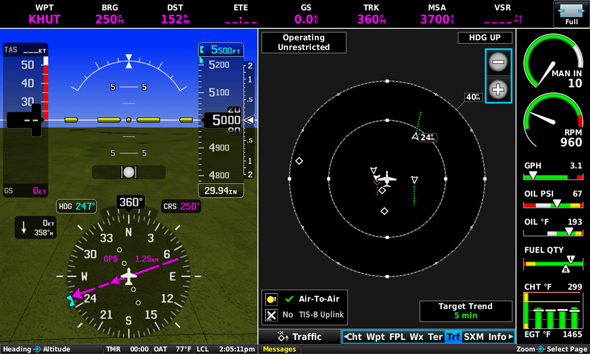 Terrain/obstacles alerting, worldwide geo-referenced FliteCharts® and SafeTaxi® airport diagrams SiriusXM® weather, ADS-B “In” traffic and weather and angle of attack sensor can all be added easily. 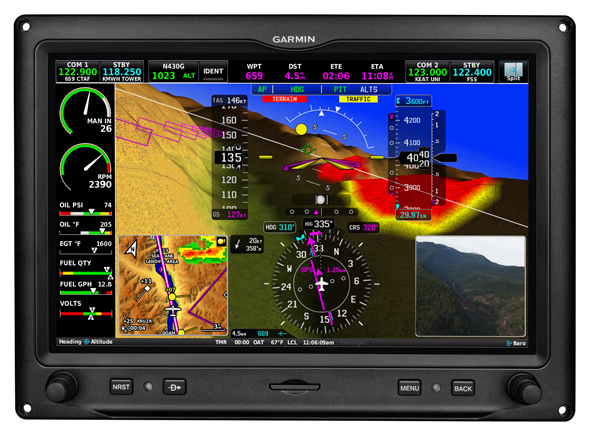 Plus, the affordable Garmin autopilot system integrates with the G3X Touch, complete with advanced features approaches and auto-trim, as well as flight director, indicated air speed hold and straight and level button when installed with an optional control panel. With up to 3 high-resolution 10.6” displays – each that and work in PFD, MFD or in split PFD/MFD mode – the G3X Touch makes it easy to create a system that will fit your needs, panel space and budget. Like it’s predecessor, the G3X Touch allows you to add on to your system as you need. So start with a single-display system that can work as your PFD or in split PFD/MFD mode, providing complete attitude/directional guidance with electronic engine monitoring and interactive moving-map multifunction (MFD) capabilities. 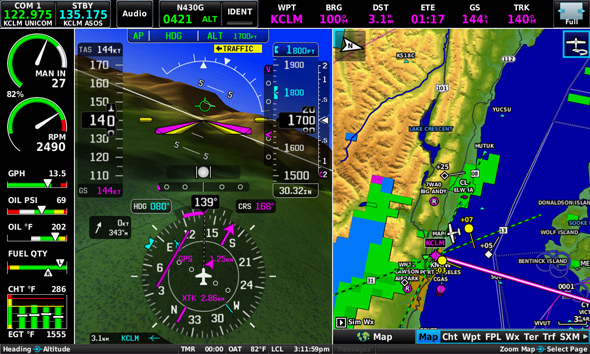 Operate 1 display as a PFD and the other as an MFD. Or see both in split-screen mode on your side while your co-pilot can access the information they want on the other side. This configuration also offers full reversionary capability in case one display fails. Get the ultimate touchscreen cockpit. This configuration includes three large 10.6” displays. 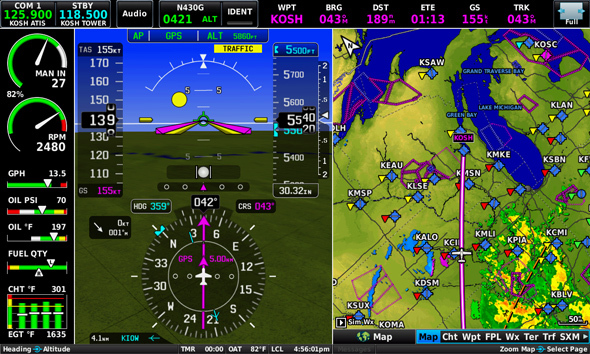 Have a full PFD for pilot and co-pilot with a MFD in the middle. Or customize it anyway you’d like. Get the information you want right where you want it. HardwareInstalls simply. Adds immense capability. 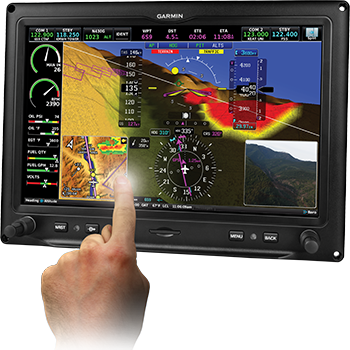 All it takes is the addition of Garmin’s affordable GSA 28 “smart” servo units to give your G3X a range of autopilot capabilities similar to those provided by our top-end flight control technology. You have the option of purchasing 1 servo (roll only), or 2 servos (pitch + roll) to add the level of capability you want. Even better, the Garmin servo provides a built-in interface to drive a customer supplied trim servo at no extra cost. When the autopilot is off, the servo provides speed scheduling for the manual trim commands. When the autopilot is on, the servo adjusts to constantly keep the aircraft trimmed. It also features a gear train with engagement clutch and the ability to back drive the brushless DC motor, providing multiple levels of safety without the use of a shear pin. Plus, servo software updates are done over the CAN bus using the G3X SD card, eliminating the need to send the servo back to the manufacturer for updates. The optional GMC 305 control panel is a dedicated interface unit that provides advanced autopilot modes like indicated airspeed hold, independent flight director, and third axis yaw damper (when installed with appropriate servos). A control wheel integrated into the GMC 305 makes for easier pitch, vertical speed and airspeed adjustments. 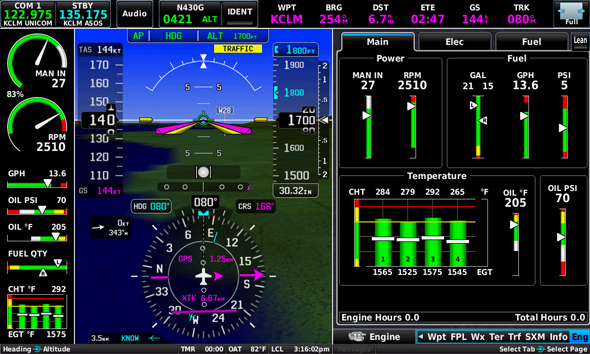 Plus, for added safety, the panel’s advanced LVL mode button commands the autopilot to help restore your aircraft to straight-and-level flight. And because the servos interface directly with the ADAHRS, the GMC 305 allows for standalone operation of the autopilot in the unlikely event of a display loss. Installation of the system is simple and straightforward, with industry-standard servo mounting kits available — as well as airframe-specific versions for the popular Van’s RV series (RV-4/6/7/8/9/10 models). Infrared touchscreen technology puts all of your flight information at your fingertips. Easily pan across the moving map by dragging your finger across the screen or pinch to zoom to see more detail. 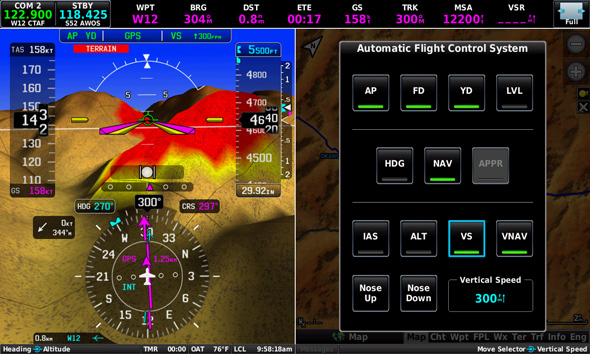 Switch from full-screen PFD to split PFD/MFD with a touch. Add an optional remote transponder and remote comm and have everything you need to fly VFR –and tune frequencies and enter squawk codes along the way with just a few taps. 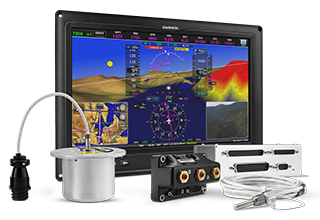 In place of sensitive mechanical gyro instruments, the G3X Touch system uses the latest in GPS-aided ADAHRS (Air Data, Attitude Heading and Reference System). Based on solid-state technology derived from Garmin’s popular certified G1000 system, the ADAHRS provides accurate and reliable referencing of aircraft attitude, heading, rate, vector and acceleration data. Because the ADAHRS is independent of the magnetometer, it can be mounted in any of 16 positions without special magnetometer considerations. For additional redundancy, the G3X Touch system optionally supports multiple ADHARS, sharing the input of a single magnetometer and outside air temperature probe, or with a redundant magnetometer and probe if preferred. The G3X Touch contains a powerful, rich and detailed moving map display. If you’ve ever wondered at any given time how far away upcoming airspace, inclement weather, traffic or anything on the moving map was, G3X Touch makes it a cinch! Simply press the knob and scroll anywhere on the map and using your current position, the G3X Touch displays the distance, bearing, and time to that location on the map as well as the elevation and GPS coordinates of that location. 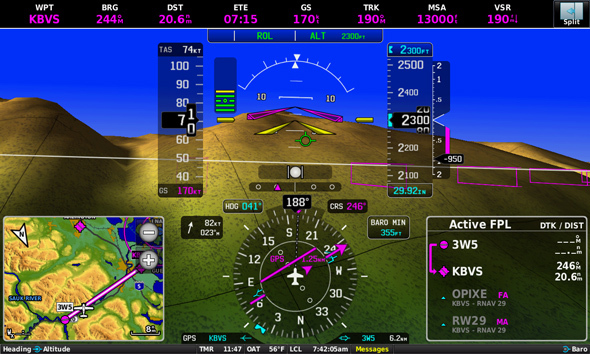 Other powerful features include an “Always On” bearing pointer to the nearest airport, extended runway centerlines, easy creation of user way points, altitude alerting tones when leaving the indicated bugged altitude, display of pilot defined checklists, and flight and engine data logging of up to a 1,000 hours on a single 2 GB SD™ card. Configurable EIS displays of engine, fuel and systems data can be accessed and monitored on the G3X Touch via the system’s ADAHRS remote sensor unit. Engine Sensor Kits priced as low are available for popular models of Lycoming, Continental, Rotax and Jabiru engines. Optional XM™ WX Satellite Weather is supported by the G3X Touch with optional subscription. 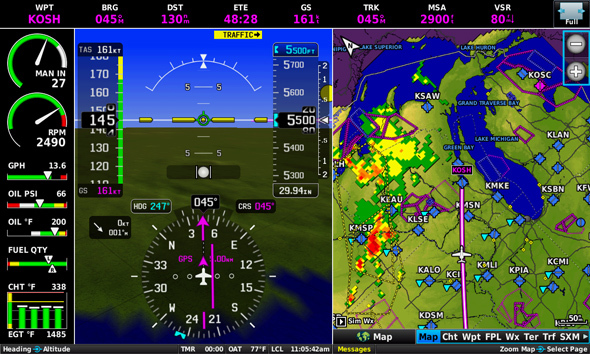 When partnered the Garmin datalink receiver built into the GDU 465, the system can display graphical NEXRAD radar, METARS, TAFS, TFRs, winds aloft, lightning strikes, storm cells and more. What’s more, over 170 channels of XM audio can also be enjoyed through the interface. When your aircraft touches down, built in Garmin SafeTaxi airport diagrams are there to help you navigate many U.S., Canadian and European airports with confidence. You’ll see a depiction of your aircraft’s exact location overlaid onto taxiways, runways, hot spots, hangars and other airport facilities. In addition to the worldwide Garmin land basemap that helps identify cities, roads and bodies of water along your flight path, the G3X Touch also provides a built-in database of both terrain elevation and obstacles that overlay on the main moving map page. 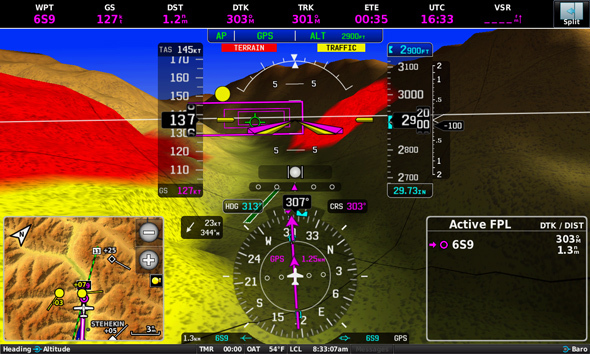 And the dedicated terrain page helps to depict terrain and obstacles of concern based on the aircraft’s current altitude. The terrain page can be displayed using a 2D map, profile view or both (pictured). While not directly focusing on the display, both visual and audible alerts help provide an automated warning to the pilot. Even more, the G3X Touch provides a 500’ callout for additional confirmation while on approach for landing at the destination airport. 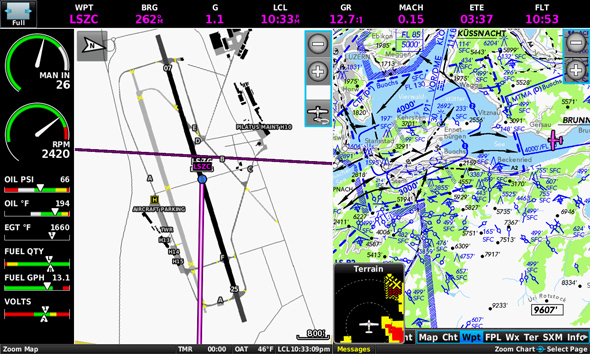 The G3X system comes preloaded with geo-referenced Garmin FliteCharts, which displays your position on AeroNav–format terminal procedures including IFR approach plates for thousands of U.S., Canadian or European airports. 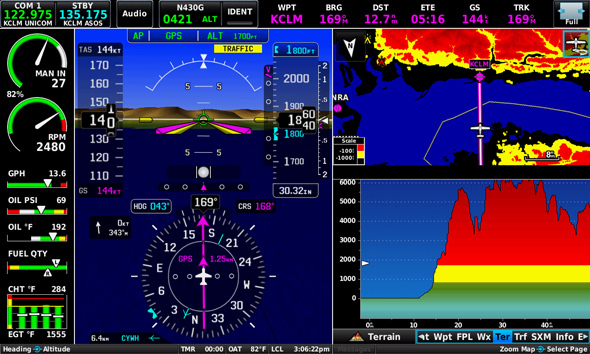 The system can also display IFR/VFR sectionals and terminal VFR charts for both the U.S. and Europe. Optional geo-referenced ChartView is also available for those who prefer Jeppesen-style charts or desire additional coverage areas worldwide (subscription required). 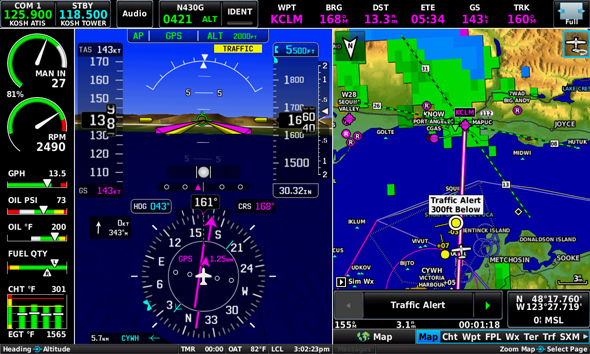 To help you keep nearby air traffic under surveillance, the G3X Touch supports traffic with either a TIS (Traffic Information Service) via an interface with your Garmin GTX 23 ES Mode S transponder or a GTS 800 active traffic system. 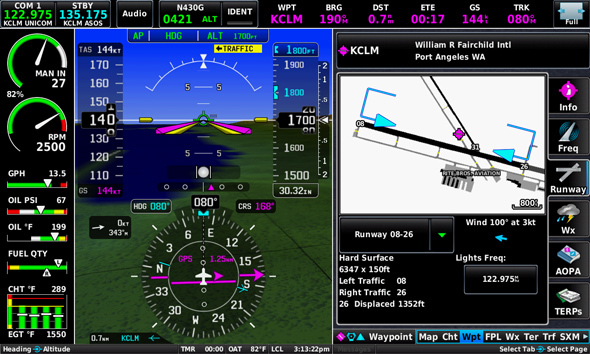 Traffic displays in 3D on the PFD’s synthetic vision (SVX) with directional arrow indications to help point out traffic at a glance. Traffic also displays in 2D right on the MFD’s moving map page or a separate dedicated traffic page can be configured. And visual and audible alerts of nearby traffic help keep your eyes outside of the aircraft. The G3X Touch is natively integrated with our navigators including the popular GTN series, as well as GTR/GNC series radios. This allows for the display of the flight plan from your GTN navigator, as well as more detailed leg instructions such as holds and procedure turns. The G3X Touch will also integrated with compatible autopilots with pitch and roll steering commands so you can fly like the pros. All of this information is displayed and easily controlled from the touchscreen. It will even fly a preset Vertical Navigation (VNAV) profile that makes it easy to get down to the desired altitude and distance from the airport. Even better, when combined with GTN avionics, this tight integration allows pilots to couple the autopilot in order to fly the entire approach down to minimums. Gain access to subscription-free aviation weather information on your G3X Touch with the addition of a GDL 39R ADS-B receiver. The remote-mounted device features ADS-B "In" technology that allows it to receive Flight Information Service-Broadcast (FIS-B) weather information over the FAA's 978 MHz Universal Access Transceiver (UAT) uplink. You can easily access and display animated NEXRAD radar, METARs, TAFs, winds and temperatures aloft, PIREPs, NOTAMs and more right on your G3X Touch display. 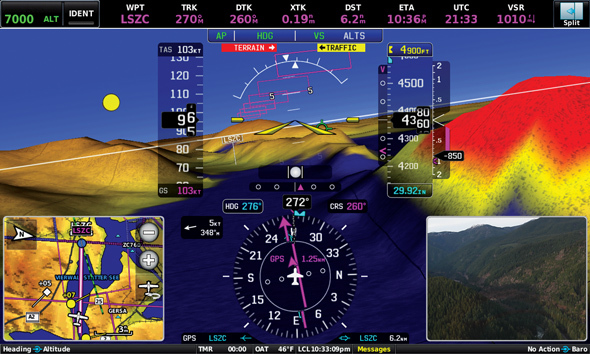 With Garmin SVX™ synthetic vision technology for the G3X Touch, you’ll always know what lies ahead — even in solid IFR or nighttime VFR conditions. Using sophisticated graphics modeling, SVX provides a 3-D “virtual reality” perspective for enhanced situational awareness. Synthetic Vision displays terrain using different shades of color and even includes streams, lakes and large bodies of water. Even more it displays obstacles, traffic (optional), the airport environment that includes airport sign posts and the runway. 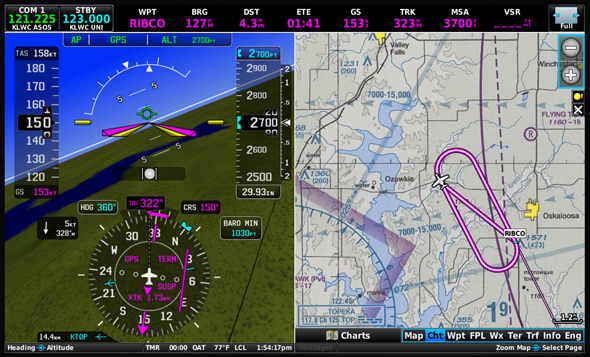 For additional awareness, your route is outlined with “windows” on the PFD screen. This virtual “highway in the sky” varies in size to depict the flight path in perspective, making it easy to visualize enroute legs, course intercepts, final approach courses, runway thresholds and more. When equipped with GDL 39 ADS-B receiver, the G3X Touch can receive and display ADS-B position reports directly from other aircraft in your vicinity. Because the FAA permits ADS-B broadcasts on 2 frequencies (978 UAT and 1090 ES), the GDL 39 contains both receivers so you can see a comprehensive view of all ADS-B "Out" equipped targets. In addition, the GDL 39 can receive Traffic Information Service-Broadcast (TIS-B) information that allows you to view the same dynamic traffic picture as ATC ground controllers. TIS-B information is available if your aircraft is either participating with an ADS-B "Out" solution, or within a certain range of another ADS-B "Out" participating aircraft in a service area. TargetTrend™ technology provides an easy-to-interpret picture of aircraft trajectories so you can better predict which may converge on your own, while SURF technology supports the display of ADS-B "Out" equipped surface targets. 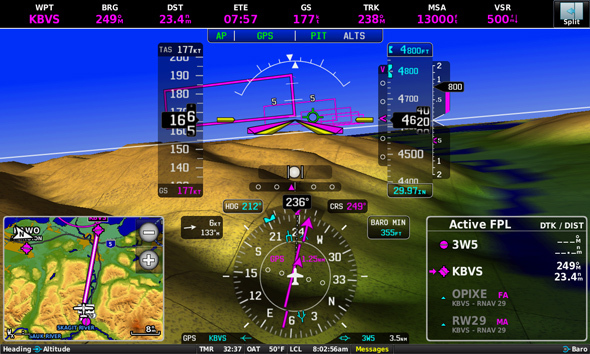 Developed specifically for experimental aircraft, the Garmin autopilot for G3X Touch features advanced features like flight director, coupled approaches and auto-trim. The GSA 28 servo features a gear train with engagement clutch and ability to back drive the brushless DC motor, providing multiple levels of safety without the need to use a shear pin. It’s available as a single servo system for roll only autopilot or with 2 servos for both roll and pitch. With the optional GMC 305 control panel, you’ll gain added features like level button (LVL), indicated airspeed hold (IAS), yaw damper (YD) and flight director (FD). It also provides additional redundancy in the unlikely event of a display loss. Speed scheduling normalizes the electric trim input controls so the pilot can provide the same level of controls input during slow and fast operations. Installation kits are available for RV-4/6/7/8/9/10 models as well as industry standard mounting. A: The G3X needs a minimum of one display and can support up to 3 displays.